In the past year, I have been learning how to paint with watercolours. It has been both a challenging and enjoyable endeavour. 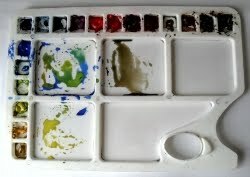 There are so many skills to acquire–how to hold your brush, mixing colours, various wet and dry brush techniques. I have learned to be patient, because if you don’t wait for a colour to dry then it will bleed into the next one you apply. Watercolours are unforgiving–you can’t paint over a mistake. I’ve produced results that are only good for tearing up and throwing in the bin. But the more I paint the better I get, and with increased frequency I’m actually liking my paintings. An important lesson I’ve learned is to not overfill the page with paint. Watercolours have a transparency that lets light through a painting, and if the paint is too dense then the unique essence of the medium is lost. I’ve been told more than once to “use the white of the paper.” The spaces you don’t paint are as important as those that you do. And so it is with writing. The words you don’t use are as important as the ones you do. Too much flowery description, gratuitous dialogue, or excessive vocabulary can muddy the clarity of what you’re trying to say. In the same way that I improve with painting, the more I write the better I become. I have learned that by giving careful thought to the words I pen, I produce a more effective sentence or paragraph and avoid extraneous prose. I don’t need to explain or describe everything, only key elements. With carefully chosen words, the reader will understand and interpret my meaning. I have learned to respect the reader. As I’ve had to do with watercolours, I have developed patience with my writing. Sometimes what I write just doesn’t seem to work, no matter how much I play with the language. If I’m patient and leave it for a while, when I come back to it, the best way to express what I want to say flows out. But thank goodness for word processing! Unlike watercolours, using a computer to write is forgiving. Mistakes are easy to repair. I can cut-and-paste, move whole chunks of text around, check facts or a thesaurus online, even mark up areas that need to be addressed. Just as long as I remember to save. I am intrigued by the idea that what I am learning through watercolour painting is inherently applied to my writing, and vice versa. 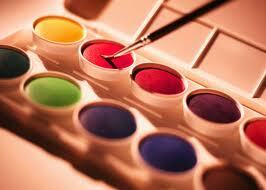 I realize that if we venture into new pursuits, we enrich our palette of skills and become better at everything we do. Back in August, when my friend Jill heard that my book was being released, one of the first things she said was, “I want to host a book event for you!” Jill is a combination of Ina Garten, Martha Stewart, and her own special kind of hostess, so I was thrilled and honoured. We pulled out our calendars and set a date. Last night, October 13th, our planning and preparation culminated in a wonderful evening. The refreshment table overflowed with goodies–white sangria, cider, crudites, cheeses, blue cheese crisps, sweets, fruit. Friends and supporters arrived, eager to enjoy the camaraderie and treats, to hear about the book and to get their copies signed by me, the author. It was a strange feeling to be the person they all came to hear– a good feeling, but strange. I mean, I’m just ordinary me. 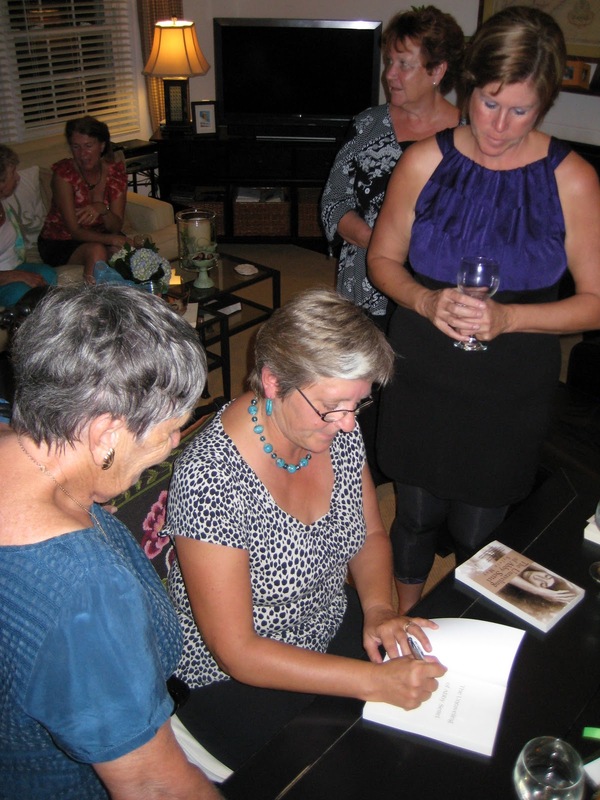 The guests were primarily ex-pats living in Bermuda who have experienced similar circumstances to Abby, the book’s protagonist, uprooted from their familiar homes to relocate to a foreign environment. They could identify with Abby. The overwhelming response to the book was emotional and enthusiastic, and appreciation for having the pluck to write and publish Abby’s story. I was deeply affected by their support and praise. In my presentation, I spoke about the inspiration for The Unraveling of Abby Settel, and answered questions about aspects of the book and how it was published. The excerpt I chose to read hit home to many of the women listening and generated discussion. Afterward, they all brought their books to me to sign. It is gratifying to know that the message in my book hit the mark. Indeed, more than one person thanked me for writing it, for getting the story out there, of how difficult it is to leave behind the well-known to begin somewhere new and unfamiliar. In response, I say thank you, the readers of my book. When you give me feedback, or write to me with your reactions and stories, you make it all worthwhile. Oh, and thank you Jill, for hosting a wonderful book event.